This article in the Kyiv Post certainly brings back memories! I love the idea of a book café. Here at home, I suppose Chapters comes close, although it's sort of the reverse ... a (huge) retail book store with a coffee shop attached, with literature as well as menu items on the pricey side. And, there are no flowers growing on windowsills. In stark contrast, Antresol offers essentially second-hand books and a much more integrated, intimate experience. Very European. 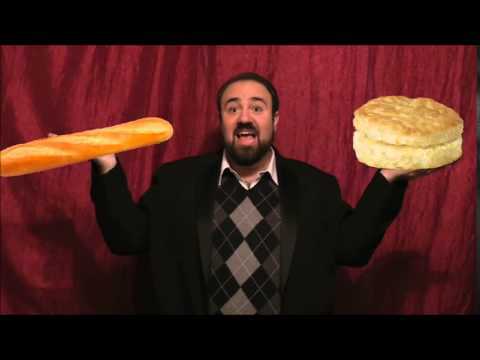 Vasyl said that Antresol is one of his favourite eating places, and it's easy to see why. The atmosphere is warm and inviting, and while I'm no intellectual I do love books so, if I lived in Kyiv I'd probably spend a lot of time there too! Vancouver's Ukrainian radio audio archives are now completely up to date at the Nash Holos website! This includes Chetverta Khvylia. On Nash Holos, a crop of new Ukrainian music this fall. So we've had several CD of the Week features in the past few weeks. 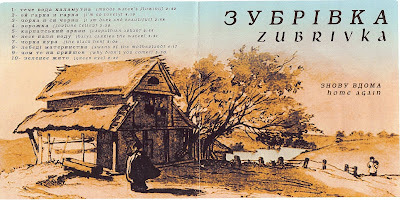 First, on Oct 12, was Anytchka, of Lviv, with her latest release Дзвони Лемківщина (Bells of Lemkivshchyna). This is a lovely collection of Lemko folksongs in Anytchka's inimitable, sunny-sounding style. Next, on Oct. 19, we featured Zubrivka of Toronto, with their brand-new debut release, Знову Вдома (Home Again). This collection of traditional folksongs is a very skillful blend of old and new musical styles that comes together to create a contemporary sound that retains a distinct ring of authentic folk tradition. Delightful! Last Sunday, Oct. 26, we featured The Female Beat of Winnipeg, and their CD ... and the beat goes on. This is a group of very talented and charming women who are (as far as I know) the only all-girl polka band around. And yes, I mean a rip-roaring, foot-stomping good old polka band. And they are good! This CD of the Week feature included an interview with the gals of The Female Beat when I was in Winnipeg on my way home from Ukraine last month. This photo was taken at the home of Joan Lasko, shortly after we chatted and enjoyed a wonderful dinner. L-R: Gail Koroluk (violin), Joan Lasko (accordion), Pawlina, Joyce Horn (guitar), Valerie Feniuk (drums). The interview is on the Nash Holos website here, and program archives are here. Here are a few pix of some of the churches, cathedrals and monasteries I visited in Kyiv. Pecherska Lavra, Monastery of the Caves: This was our first tour in Kyiv and I was surprised at the size of this amazing church. There seemed to be quite a bit of it that was off-limits. However, we covered a lot of ground nonetheless. We went into the "caves" where the saints were buried. I felt very much the foreigner. I couldn't help thinking how sad it is that I (like so many of my Canadian Ukrainian compatriots) grew up in this faith, yet came here to where it all began, not knowing even the proper protocol of venerating these saints, let alone about their earthly lives and why they ended up as saints. We also saw the Scythian Gold art exhibit somewhere in here, which I found utterly fascinating. So much wealth for what has (in my experience anyway) usually been referred to as a "peasant" nation! We were taken on a trip through time starting with the prehistoric era of the Sycthians, et.al, then on through the golden era of Kyivan-Rus followed by the rich (literal and symbolic) heritage of the golden age of the Ukrainian church. As usual, not nearly enough time to savour the experience. St. Sophia Cathedral: Although this church is now just a museum, and not an active church, it still had an incredible spiritual "pull." None of us wanted to leave because we all felt like we were in this wonderful bubble of serenity and peace. On top of that, it is gorgeous inside. As well, it was awesome to learn the historical details and see some very old relics. Coming from Canada, where 90-year-old buildings are classified as "heritage buildings" it was a real treat to see such old stuff. 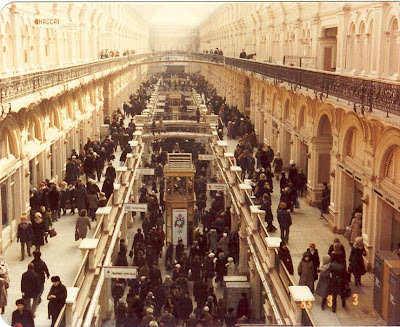 I did visit St. Sophia's in 1984 and from what I can recall, there has been a fair bit of restoration done to it since then. Here's the chapel that is being used while the cathedral is being built. Not very big but nonetheless impressive in its beauty. Apparently this is Orthodox territory and there's a lot of infighting amongst them as it is (Kyivan Patriarchite, Moscow Patriarchate and Ukrainian Autocephalus Patriarchate all duking it out over the real estate) ... without adding yet another contender to the mix. So the Catholics as new kids on the block aren't finding any red carpets rolled out for them. Well, all I can say about that situation is that it's a good thing the Lord Jesus rose from the dead and ascended into Heaven. Because otherwise He'd be getting downright dizzy spinning in His grave. But, there's no denying the buildings are gorgeous, inside and out. Here's an interior shot of that chapel; we arrived just as Divine Liturgy was ending so we had a chance to go inside, enjoy the peacefulness and beauty, and take some photos. This is St. Michael's Golden Domed Monastery. This 11th century treasure was destroyed by Stalin (along with much priceless, ancient artwork) and rebuilt after Independence in 1991. It is stunningly beautiful inside of course, and the sight of it from the street was quite striking. Equally striking, I thought, was the sight of elderly ladies standing outside the entrance of this magnificent building, begging. While it is wonderful that these glorious churches that were destroyed by the soviets are being rebuilt, how can the irony be lost on those who (re)build them that money is so readily available for golden domes but not for poverty-striken women? One could ask, WWJD? And would He approve? I suppose elderly Ukrainian women are at least fortunate that they're not on the radar of human traffickers. (Some great fortune, but no doubt any trafficked young woman trapped in a faraway brothel would gladly trade places.) As the song goes, when will we ever learn? I don't recall the name of this palatial building which was nearby (I'm taking notes for sure next time I go!) but it was so majestic-looking that I had to get a shot of it. Next to the church was a commemoration of the Holodomor. We were told that such ceremonies are ongoing in this 75th anniversary year of the soviet-engineered genocide by famine of Ukrainians in 1932-33. On Friday, my last full day in Kyiv, our tour group went on a day trip to Kaniv, the final resting place of the revered Ukrainian bard Taras Shevchenko. This was the view from the monument over his grave. It was all he ever wanted in life ... to gaze at his beloved Dnipro and the lands and horizon beyond it. But he was denied that simple pleasure by tsarist Russia which kept him in exile, and in chains. Isn't it bizarre (and sad) how a powerful imperialist regime could be so threatened by a poet whose words just encouraged the Ukrainian people to be proud of their language, their history and their heritage, that they persecuted him for his entire life? Below is a snapshot of the actual monument itself. Our tour guide told us that originally there was a large cross marking the grave, but the soviets took it down and replaced it with this statue. It would seem the successors of the tsarist regime were similarly threatened... by a religious symbol. This is the tour guide (I think his name was Danylo Victor) who took us around the park and told us about the life and times of Taras Shevchenko. His English was impeccable and he had us all spellbound. I knew that Shevchenko was an accomplished painter, but I hadn't actually seen much other than poor reproductions of his self-portraits. Danylo Victor showed us some nice photographs of Shevchenko's paintings. He was truly brilliant. Quite a lot of exquisite embroidery and paintings. Here's a close-up of the thatched roof. Quite intricate, and obviously required a fair amount of skill! Isn't that a brilliantly beautiful fence for the flowers? Our next stop was lunch in the restaurant at the hotel on the premises. But first, a detour. We had all heard about the possibility of encountering toilets that weren't exactly what we're used to, and that were essentially just holes in the floor. We came prepared with our own paper and little bottles of hand sanitizer, but weren't quite sure what to expect. Anyway, I must say I was just glad to have been wearing leather (i.e., washable) sandals and bare feet! Actually, there was lots of water and altho it smelled like an outhouse, the facility was actually reasonably clean. It was very nice to see several groups of schoolchildren visiting the monument with their teachers, and learning about this important figure in their history. As you can see, the wonderful weather that greeted us a couple of days earlier was long gone, so we didn't linger much outside. After our delicious lunch we boarded the bus and headed back, past fields of corn and sunflowers growing in rich chernozem ... the fabled black earth Ukraine is famous for. And, having spent many childhood years on a Saskatchewan farm with a very well-used stone boat, so much rich soil with not a single stone in sight was quite amazing to see. Several low-cost passenger airlines hope to launch flights in Ukraine within weeks, offering less expensive direct flight tickets between Kyiv, European cities and Dubai. In negotiations with airlines wanting in on the Ukrainian market, Vinskiy said the government seeks competitive ticket fares, new aircrafts and contemporary services such as online booking. Having once worked in the Canadian airline industry (the former Canadian Airlines International and predecessors) for many years, it was interesting to travel on a domestic flight in Ukraine and draw some comparisons ... especially to my last domestic flight(s) on Aeroflot back in 1984. It was a Boeing 737, an aircraft I am very familiar with. The interior was starting to show signs of wear, and there was no bridge so we had to take the stairs up. However, the in-flight service was excellent and the flight was smooth and uneventful. (The best kind!) The flight attendants were attractive, smartly uniformed and distantly professional. They reminded me of the "good old days" in the airline biz, before the advent of wise-cracking, casually dressed flight attendants. They had their work cut out for them when we landed, though. No sooner did we touch down (quite smoothly, btw) than we saw several passengers around us whip out their cell phones and start gabbering away (in Russian of course). And right after the captain asked passengers to remain in their seats and refrain from using electronic devices - including cell phones! - until the aircraft had come to a complete stop. Sigh. OK, so it's not like that doesn't sometimes happen here. But then some yahoo got up and opened the overhead bin, left it open and then opened another one across the aisle! Hello??? We're still moving, dude, and at quite a speed. We heard a yell from the back and the male attendant (a burly blond hunk) came rushing up, snapped the bins closed and politely shoved the bozo back in his seat. I felt like clapping and yelling "Bravo!" ... but managed to restrain myself. (Just.) I really wished they would have gone after the cell phone yakkers as well, but that would probably have been too exhausting, not to mention an exercise in futility. With this experience, I was starting to understand why Ukraine is having a hard time getting into the EU. If that lingering soviet mindset isn't holding the country back in its development, it sure isn't helping move it forward. I was in Kyiv Sept. 10-13, with really only two full days there. Not nearly long enough! We were supposed to arrive mid-day on Sept. 9 and have 3 days in Kyiv. But a delay on our Air Canada flight to Toronto from Winnipeg (where I hooked up with some family members and the tour) resulted in missing our connections on Austrian Airlines from Toronto to Vienna and Kyiv. So we spent an extra 24 hours enroute, with two overnight stays (such as they were) in Toronto and London, and much sleep deprivation. However, we finally made it ... and lucked out on the weather. It was warm but not hot, about as perfect as you can get. Kyiv (and especially Khreshchatyk) was nothing like I remembered, only а bit like I expected, but all I hoped for ... and more. What an incredible city! So vibrant and colourful, teeming with life and an air of hopefulness that I didn't detect back in 1984. It helped that this time I knew some locals (thanks to the internet!) and was able to hook up with one, and meet even more. After getting my mom and myself settled into our room at the Hotel Rus, my first order of business was to call my fellow blogger and good friend Vasyl... who was a little concerned that I didn't call as promised on (what was supposed to be) my first day in Kyiv. But we connected and agreed to get in touch the next day, after our tour of the Pecherska Lavra (Monastery of the Caves). I had heard enough about "proper attire" from friends including Orysia and Myrna. My nieces, however, were under the impression it was ok to wear slacks, as was their Baba. After we took a family group picture, some Russian Orthodox nuns walked by and gave us a dirty look. Shortly afterward my jeans-clad niece said one of them beat her with a cane! Seriously. She thought it was just a jostle at first, but after 3 hard whacks on the leg she figured it was deliberate. So I was very glad I wore a skirt and a scarf! When we got back from the tour, we wondered what to do for lunch. I called Vasyl and he suggested meeting at a favourite restaurant of his, called Antresol. My sisters and nieces came along and we all ordered the duchess salad, which Vasyl recommended (and which was quite delicious.) To drink, we all (except for one wise niece) ordered what we thought would be some nice fresh-squeezed lemonade ... you know, the kind you get at fairs and exhibitions here at home? Well, silly us. We forgot we were far from home. What we got was fresh-squeezed lemon juice. Pure, plain, pucker-powering lemon juice. It was drinkable once the waitress brought us a pile of sugar cubes and some water. (What she must have thought of us crazy Canuck women is anyone's guess.) In our defence, none of us could speak a word of Russian beyond "dosvidannya" (not a very helpful word in that situation). Likewise, the poor waitress spoke neither English nor Ukrainian. Nor could anyone else ... until Vasyl got there. All in all, quite the experience and a lesson remembered for the rest of our trip! Afterwards, he very gallantly took us shopping. All five of us. (Brave man!) I needed batteries and (obviously) a hair dryer, so he took us to Цум which he said locals consider a sort of bargain store. After I got my batteries and hairdryer, my sister and nieces wanted to shop for clothes and shoes so Vasyl, my other sister and I left them at the underground mall on Khreshchatyk. Then we hit some bookstores ... my favourite! My sister teaches nursery school and wanted some new books for work, so Vasyl pointed her in the right direction. He also helped me find some excellent Ukrainian-language synonym-antonym dictionaries. After that, we went to the famous Kupidon bar. There, we met Vasyl's friend Roman Romanovych before he went off to do his radio show (which is called Roman welcomes his guests and airs Thursdays at 6 pm local (Kyiv) time). Then, who should show up but Andriy Denisenko, a.k.a. Riffmaster, and his manager, Andriy Honcharuk. (L-R: Andriy H, Vasyl, me, and Riffmaster.) What truly great guys. I wondered if a Ukrainian rock star and his manager would be interested in talking to some old broad who does this little radio program in Canada. But as you can see they were very charming and chivalrous! :-) Very down-to earth and not the least bit pretentious, just a delight to be with. BTW, Vasyl tells me to expect more Ukrainian-language releases from Riffmaster, as he has discovered that doing music in his native language allows him a much richer musical expression... and his fans agree. Hopefully those new releases will find their way to me. In the meantime, there's a Riffmaster tune on this Sunday's playlist which Vasyl sent me earlier. It's called Misiats. The next day was a tour to Kaniv, and then supper at a restaurant called Козацькa Втіхa (I think? ), where Vasyl said we could get some good, authentic Ukie food. We also lucked out and got some live music to go with it. The only downside to that fun evening is that it used up most of the memory card, and I had an interview with Dirk the next morning (which Vasyl rescheduled from the night before). BTW, Dirk is the guy who, along with Vasyl, is pretty much responsible for the drive to get Kyiv on the board of the world edition of Monopoly. He is a Swiss national with a peculiar, and very powerful, love for Ukraine. Another down-to-earth, unassuming guy with a huge heart. We had about an hour together before I had to leave for the airport and the flight to Simferopol. Over a cup of espresso (the first time I ever enjoyed strong black coffee!) Dirk and Vasyl gave me a detailed overview of the political situation in Ukraine ... as well as a fair bit of sympathy when my recorder stopped in the middle of the interview and the floor refused to open up and swallow me whole. Hopefully I will eventually catch up with Dirk for a long-distance interview to get his take on the outcome of that Monopoly vote, and plans for World Edition. There were a couple of whirlwind tours during our brief visit to Kyiv, including a trip to Kaniv, the burial place of Taras Shevchenko. As I started out saying, it was not nearly enough time in Kyiv. I would dearly love to return and spend much more time there, exploring the fascinating historical and modern sights, and mingling with the wonderful people who live in that amazing city. Ruta Yawney is a very talented musician who has been practicing her music and her professional skills here on the west coast of Canada for many years. I had the pleasure of seeing her perform live a few times in the early 1990s, before she moved to Bowen Island. 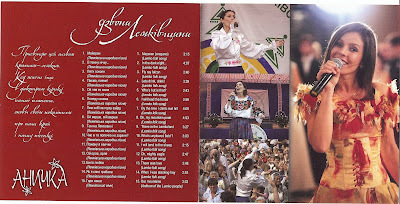 She has released 2 CDs of Ukrainian and cross-cultural folksongs, of which selections have been featured on Nash Holos. Recently, a local paper published an article about Ruta. ... Ruta Yawney holds a bachelor’s degree in music therapy and has been working in the field for over 15 years. She says that it has been music that has facilitated her way of finding peace. “Music allows us to be filled with light,” as Ruta puts it. Many islanders have witnessed some of the magical moments of Ruta Yawney’s musical performances over the past 16 years here on Bowen. She is known for her captivating vocals and exotic Ukrainian bandura playing. Ruta has taught many children in Bowen’s different schools. ... For the past five years, many have seen Ruta behind the piano, playing guitar or flute, as the director of music at Bowen Island’s Little Red United Church. To hear a selection from Ruta's most recent CD of Ukrainian songs, tune in to the October 12 Nash Holos podcast here. The selected track is an instrumental bandura piece composed by Hryhory Kytasty. For more information about Ruta, visit her website. On September 12, 2008 the Ukrainian Museum of Canada of the Ukrainian Women’s Association of Canada in Saskatoon, Saskatchewan hosted the opening of their latest exhibit – Ukrainian Weddings. Ukrainian Weddings, a multi media display, was developed by the staff at the Kule Folklore Centre at the University of Alberta for its initial launch at the 2007 Ukrainian Festival at Harbourfront in Toronto, Ontario. The exhibit is a series of panels and videos that explore Ukrainian Wedding traditions through four different times and settings. These settings include classic Ukrainian traditions from Ukrainian villages of the 1800s; a 1995 Bukovynian village wedding, wedding traditions from pre-1940 western Canada and post-1970 Ukrainian wedding traditions. The Saskatoon exhibit also has antique Ukrainian wedding headpieces, examples of Korovaii – a traditional wedding bread – and an authentic wedding dress made by one of the donors of the Kule Folklore Centre – Mrs. Anna Kuryliw – in her Ukrainian village in 1936 and brought to Canada for her wedding to Wasyl Kuryliw. The decorated tree in the front of the picture below is a traditional Ukrainian Wedding Tree - a "derevtse." Several members from the Kule Folklore Centre were on hand for the opening of the exhibit which featured refreshments and hors d oeuvres and a tsymbala player who greeted the 130 guests at the exhibit entrance. Dr. Andriy Nahachewsky, Huculak Chair of Ukrainian Culture and Ethnography and Director of the Kule Folklore Centre and Nadya Foty, Archivist of the Bohdan Medwidsky Ukrainian Archives who was instrumental in arranging the exhibit collaboration with the museum, spoke to the audience about the Kule Folklore Centre and its role as the leader of Ukrainian Folklore outside of Ukraine. The exhibit (which has since been shown at the Moncton Museum, New Brunswick; Vegreville Pysanka Festival; several Edmonton events; and Folkfest in Saskatoon) will be at Saskatoon’s Ukrainian museum until early November. If you're fortunate enough to be in the vicinity of this fabulous exhibit, I hope you'll take the opportunity to see it. As for those of us out here in Lotusland, we're hopeful it will one day make its way to the west coast! On Nash Holos, there's a recipe for Brussels sprouts with chestnuts (perfect for Thanksgiving dinner! ), some ideas and tips for stopovers in Europe, reflections on the life and year of St. Paul, another proverb, and more! As usual there's plenty of great Ukrainian music! The Canadian spotlight is on Winnipeg, with selections by Shoom, Kalyna, Sofia Bilozor, Paris to Kyiv, The Female Beat, Canadian Rhythm Masters, Freddie Chetyrbok and Molodtsi. As well, some selections from the CDs I brought back from Ukraine, by Buttya, Mandry and Pikkardiyska Tertsiia .... and an audio clip of a live performance I enjoyed in a Kyiv restaurant by 2 members of a group called Cheremosh. Irena Bell, producer of Ottawa's Ukrainian radio program, caught an interview that aired recently on Radio Canada International (RCI) with Roman Brytan, producer of Radio Zhurnal in Edmonton. The topic was Ukrainian radio programmes in Edmonton. Province reporter Susan Lazaruk wrote a very touching article about the passing of Michael Saranchuk, a WWII veteran and pioneer of Vancouver's Ukrainian community. Michael Saranchuk, a longtime Eaton's employee dating back to its Gastown warehouse era and a pioneer of the Ukrainian Catholic Church in Vancouver, died on Sept. 16, a week shy of his 93rd birthday, after a brief illness. Saranchuk, who as a teacher in his native Alberta taught the late Ramon Hnatyshyn, a former Canadian governor-general and MP from the 1970s and 1980s, also worked for the country's "secret service" during wartime, keeping the details of those specific duties a secret to the day he died. He was born on Sept. 24, 1915, in Edmonton, three years after his parents Dmytro and Anna came from Western Ukraine in the so-called "first wave" of four waves of Ukrainian immigration over the century. Ukrainian TV viewers in Vancouver recently received a poke in the eye. With the purchase of Channel M by Rogers Media, it's little surprise that the independently-produced Kontakt TV has been taken off the air in Vancouver, to be replaced with Svitohliad, which has been airing on (Rogers-owned) Omni TV in Toronto for some years. Svitohliad airs Sundays at 7:30 am on Channel M in Vancouver. I'm sure it's a nice enough program, but it's only a half-hour long. Kontakt was a full hour long. And, whereas Kontakt aired twice a week (albeit as a repeat), Svitohliad airs only once... at a less than ideal time. While I was away, an email went round informing people about this change. So just now I called the station to follow up. I spoke with a lovely lady named Liveny, who told me that the programming changes reflected audience viewership. When I explained that I've been giving Channel M free publicity on Nash Holos due to audience interest in Kontakt TV, and that many people in the local Ukrainian community are upset at the change, she was quite surprised. She then said she would fill out a caller comment card and pass it on to management. So, if you live in the Channel M viewing area and are upset about the reduction in Ukrainian programming, you can send Rogers management a message by giving Liveny a call and registering your displeasure. (The more calls they get, the stronger the message.) But please be nice to Liveny ... it's not her fault! And besides, she isn't given a whole lot of (accurate) information to pass along to the public. The number is 604-678-3800. Or, if you prefer, you can send an email. When I asked Liveny if I could discuss the matter further with the programming director, she said that all programming decisions are made in Toronto. Боже. The promise of local programming (which, for us here in Vancouver, has yet to be delivered) just got even less likely. Nothing against Toronto, but it's a long way from Vancouver and the community out here is a tad different. It would be nice to have programming that reflects, and serves, our local community. The Commission reiterates that the essence of the Ethnic Broadcasting Policy is to encourage the reflection of local communities, both to themselves and to the wider world. However, IMHO, where the Ukrainian Canadian community is concerned, broadcasters miss the mark by a long shot... and always have done. Canadian television has never accurately reflected our community, much less its impact on Canadian society. I'm not sure if the Commission knows this (or cares), but it would be interesting to find out. And what, if anything, they're prepared to do about it. The CRTC contact details are here. There's also a quick and easy online form. If you do follow up (with Rogers/Omni, the CRTC, or both) please post a comment here and let us know how you make out. Well, I see that my last post was made on August 28 ... wow, does time fly when you travel to Ukraine! Yes, I'm just back from the trip of a lifetime. My mom decided to take a trip to Ukraine and invited her brood along. Three of her daughters (including me) and two grand-daughters were able to make the trip, so on Sept. 8 we left Winnipeg together, and returned on the 24th. I returned home to Vancouver on the 28th. We went to Kyiv, Yalta, Lviv and Vienna. It was quite incredible. I was the only one who'd ever been to Ukraine, but that was in 1984, so it was almost like the first time for me. Quite a few surprises all around... some pleasant, some not. But we all agree, it was a fabulous experience all around. I have quite a lot of pics, notes and memories to sift through ... and savour! So please indulge me as I share my recollections of this awesome trip over the next little while.